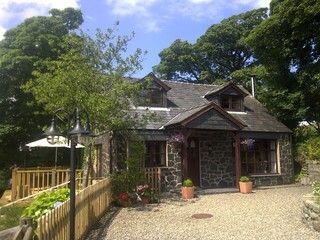 Beudy Brics, our most romantic cottage, is a detached converted barn built of slate, stone and brick. Perched at the highest point of Cyffdy, with stunning views across the 4-acre sheep paddock to Bala Lake, this truly delightful cottage is a great favourite with romantics, due to its secluded and very peaceful location. With newly refurbished interior throughout, the cottage is designed for privacy, comfort and warmth for year-round holidays. Beudy Brics is surrounded by its own private gardens to the front, side and rear, and is approached by a path of 5 steps from its driveway and parking area. There is a gravelled, floodlit front garden area with walled flower beds, tiered rockery and barbecue. The rear paved garden has a timber bike store with views of the Arenig mountain. This dolly-house cottage is frequently visited by badgers, foxes and rabbits and with its own bird table for “all-day viewing” right outside the window, it is a really peaceful haven for lovers of wildlife. Holidays are priced inclusive of linen, towels and fuel. No smoking inside the cottage please. Sorry, Beudy Brics is a no pets property. Minimum stay 2 nights. 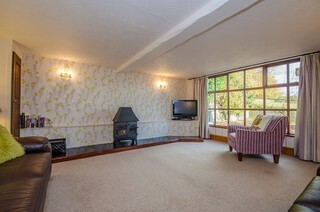 Ground floor: Entrance to split-level dining kitchen, sitting room with cast iron Villager stove on Welsh slate hearth. Downstairs modern bathroom, fully tiled with shower. Stairs to first floor which comprises the master bedroom with double canopied bed and twin-bedded room. The property features central heating, a microwave, a fridge/freezer, a washing machine, a dishwasher, 2 TV’s, a DVD player, a video and a radio/cassette/CD player. There is an over-bath hand-held mixer shower and a shaver point. A travel cot, high chair, safety gate, socket covers and fireguard are provided. 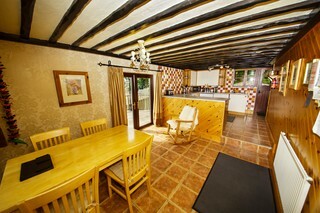 Cottage rental is inclusive of bed linen, bath mats, tea towels, towels and fuel. For your convenience, a power-washer and storage for cycles is available. Cycle hire available in Bala. A barbecue and garden furniture is provided and there is a Barn for barbecues if the weather is not co-operative. An elegant function room - The Retreat - is available for hire for group usage by prior booking. For younger guests, in the Cyffdy grounds there is a large paddock with resident goat and sheep, and sledges are available for winter holidays. The Timber Trail Play Area, constructed to ROSPA standards, provides endless hours of fun, and the Barn offers shelter for wet weather play. 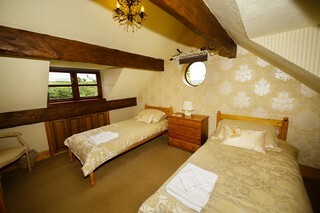 Freshly made beds, pre-heated cottage and a Welcome Tray of tea, coffee and biscuits on arrival. Parking for several cars/boats per property. Groups welcome, but sorry, no stag or hen parties. This cottage is in the same location as 3 other 5-Star holiday cottages, and can be booked together to sleep up to 20 guests. The sister cottages are also 5-Star and are Stable Nook, Shippon Roost and Poachers Pocket. Designed by @mser ©2019 Bala Cottage Breaks - All rights reserved.